I’ve been waiting to read Ready for Air: A Journey Through Premature Motherhood ever since I met the author Kate Hopper. Time is evasive; I think I met Kate a few years ago. Our meeting was kismet. On the local writer’s collective website, I saw an event with a teacher from The Loft Literary Center in Minneapolis. I haven’t lived in Minnesota since 1994, but I distinctly recall the poetry writing class I took at The Loft: the teacher there who went to Macalester years before I did, and how the streetlamps looked as my older brother drove me home from class to my tiny studio apartment. I knew I wanted to meet this writer from my home town. Within minutes of introducing myself to Kate, the evening’s host asked us how we knew each other, hadn’t we just met? Why were we acting like best friends? Beyond The Loft connection, Kate went to my college right after I graduated. Not only that, her dad was a professor there, in fact her dad was my brother’s adviser and favorite professor. The next day my brother Mike said he had met Kate when she was a teenager during dinner at her dad’s house. Kismet. Kate has a charismatic, room-enlivening energy about her, and that night I relished talking deeply with her about our respective memoirs, both in different forms. I was just writing my second draft, while Kate told me she might be on the decade long path to publishing her book. The day I read on Facebook that she found a publishing home for her memoir about premature motherhood, my heart filled with joy for her. And I knew with certainty that her book would make a difference to its readers. I bought Kate’s book the day it launched. A few nights later, I meant to only read a few pages of text. Instead, I could not stop turning pages. I’m not giving anything away to say Kate’s memoir starts with preeclampsia, dives into premature birth and a harrowing dip in Kate’s health post-birth. What’s interesting to me is that every reader knows Kate lives: she wrote the book, and here she is on book tour! But I could not stop reading until I knew Kate was safe. That, my friends, is completely impressive memoir writing at work. One would expect no less from a writing teacher, right? Or maybe it’s that one would expect no less from Kate once you have met her. She believes in the power of story to transform, and she believes everyone is a writer. Her other book is Use Your Words: A Writing Guide for Mothers. She has made it her life’s work to let every mom in on the writer’s secret: writing your story is a fantastic way to heal and learn more from our wounds. Reading Ready for Air is another avenue to healing. No, I didn’t experience preeclampsia, premature birth, the NICU, or being homebound with a premature baby. None of this matters when reading Kate’s book. Her words transcend her experience and her experience becomes universal through her skilled hands. I cried as I finished reading the book, feeling both her transformation and my own transformation during different circumstances in my own life. This is what great memoir writing does: it helps us on our own paths in life, connecting us and making the road more bearable and more beautiful. I, for one, am not surprised. The night I met Kate, she enveloped me with her warmth, her realness, and her willingness to say the hard things to make them a bit less hard. I knew she was a truth teller, a memoir writer, a woman who would roll up her sleeves and work on her book until it was just right. Kate, my friend, Ready for Air is just right. I’m giving away a copy of Ready for Air! Leave a comment below, and I’ll randomly draw a winner’s name this Friday! 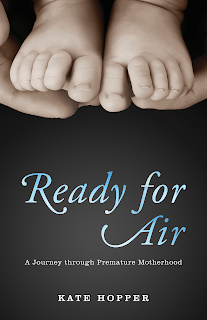 The University of Minnesota Press and the Sustainable Arts Foundation are making sure every hospital NICU on Kate’s website’s list receives a free copy of Ready for Air. Click here and add your NICU to Kate’s list, so readers who really need this book can find it at their NICU! Great idea! And sounds like a wonderful book that would be a real treat (and important, too) to read. Nice review! I will read it for sure – I have several friends who have had similar experiences of premature birth. I actually just saw this book in a Dunn Bros last week here in St. Paul, MN! Great review. My son was a NICU baby, so I’m looking forward to reading the book for sure. Thanks for the review! Looking forward to feeling the healing balm of this story. Dear Nancy, thank you so much for your kind words! I love that you say the book will be a healing balm for parents (and that your friend said I got it right!) Whoop! I love that so much. Thank you, friend. And I look forward to the celebration of your memoir, which I know will make its way into the world before long! Great review. I loved these words of yours. “This is what great memoir writing does: it helps us on our own paths in life, connecting us and making the road more bearable and more beautiful.” Please do not enter me in the draw as I have read and love the book and Kate. I am just stopping by to meet the people hosting her blog tour. Thanks.